Buying a pet bed can be expensive and sometimes frustrating when looking for a specific size or type. This is a guide about homemade pet beds. 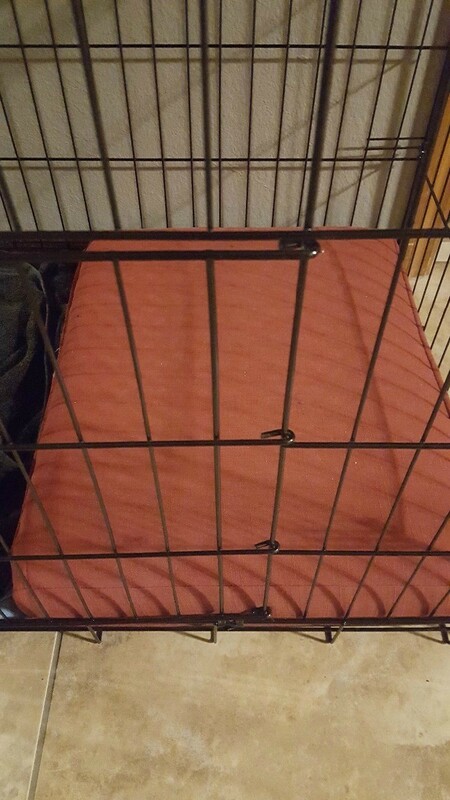 If you're tired of having to replace your large dog's bed and spending a lot of money, I suggest you buy a baby crib mattress and a plastic zippered mattress cover. 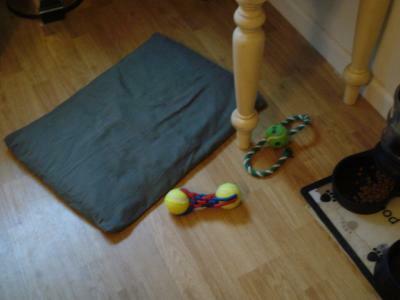 Put a crib sheet over it and you're set, clean up is a breeze and you'll never need another dog bed. 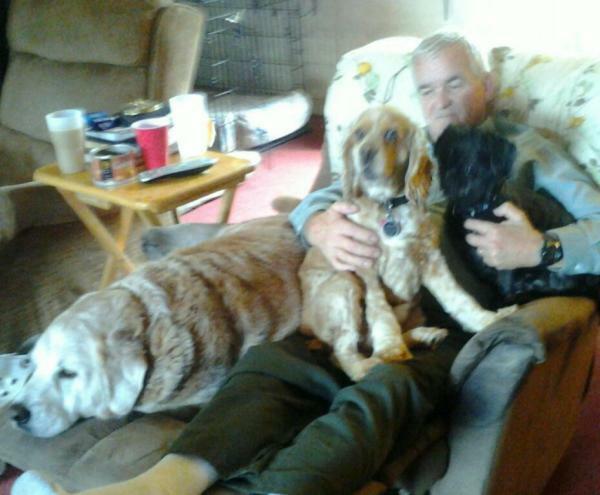 We have two large dogs - 90 and 120 lbs. that sleep in our bedroom. After going though several dog beds (starting at $40 each times two), because of their size (they literally flattened the beds), I finally convinced my husband to buy a twin mattress. What a difference! Not only is it holding up better, but it's easier to care for. I just put a mattress pad on it and use twin sheets as a cover. With my two I usually change sheets twice a week. Have you ever had to take the cover off a regular dog bed and wash it? I even made sheet covers for their other beds, but they still didn't protect as well as the mattress pad. I periodically spray air freshener on the mattress and wash the mattress pad. As an added bonus, because my bed sets high off the ground, I can slid the dogs' bed underneath when needed. Recycle your old bed pillows to make your pet a bed. Put the old bed pillows through the washer and dryer to clean and fluff them up. Then use the pillow fill to make a custom bed for your pet. Save your old sheets and stained table cloths for projects like this - they can be used to make the ticking. 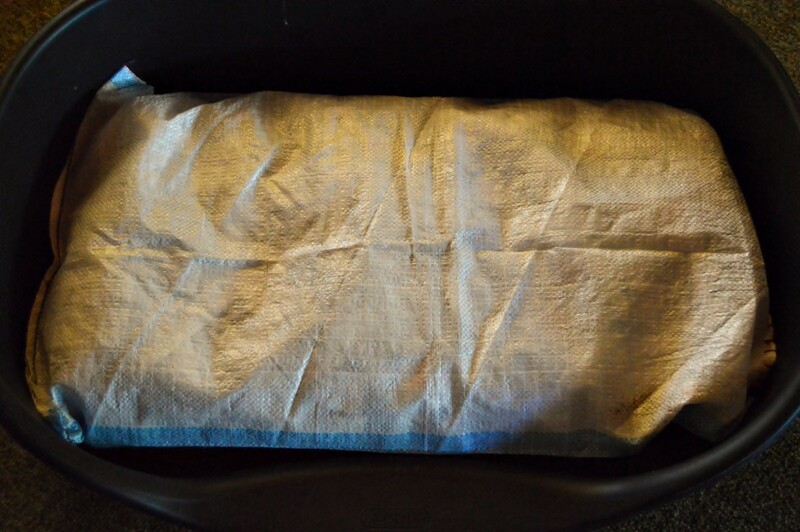 Make a cover for the bed using a zipper or pocket closure so you can remove the cover to clean. The best part is you can custom fit the bed to your pet and space. And, if you recycle all your materials, this project might only cost you an afternoon. I had to throw out the mattress to our dog's bed. So I used packing peanuts with a freshly laundered cover to replace it with. Works fine! Our cat loves to sleep on something that we use or have used. We had a bunch of odd socks and holey socks from years gone by. Originally I was going to make sock puppets but had a better idea. My dogs are very destructive and manage to tear blanket, cushions, and conventional dog beds by 'digging' to make themselves more comfortable. They have also destroyed 2 lounges, (sofas/settees), and 3 single mattresses I gave them as beds. My dogs follow me all day long and I was constantly falling over them in my home office. I removed the closet doors and layed down 2 old couch cushions and covered them with comforters that I bought at a Thrift Store. It sleeps 2 dogs very comfortably and I have a lot more room to move around. 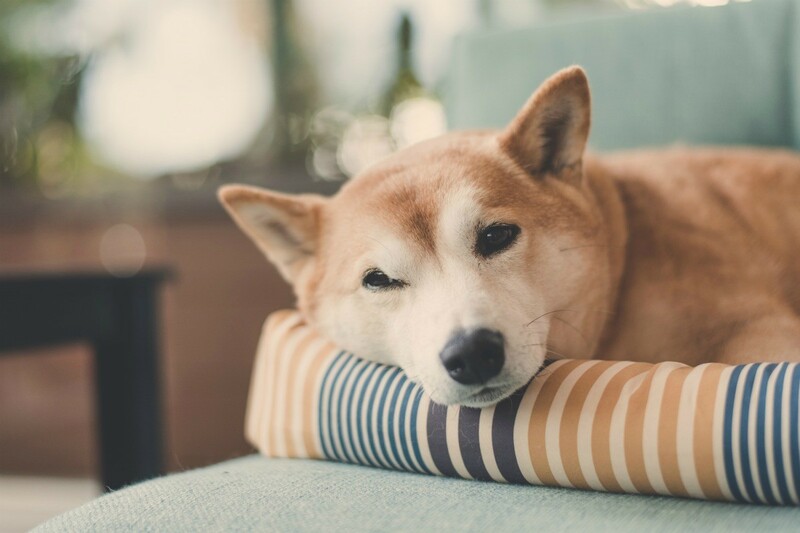 If you have ever purchased a pet bed, you will know from experience that the bedding often becomes stinky and needs cleaning. I always look for beds with zippers so that you can wash the cover. My older dog started having bladder issues. 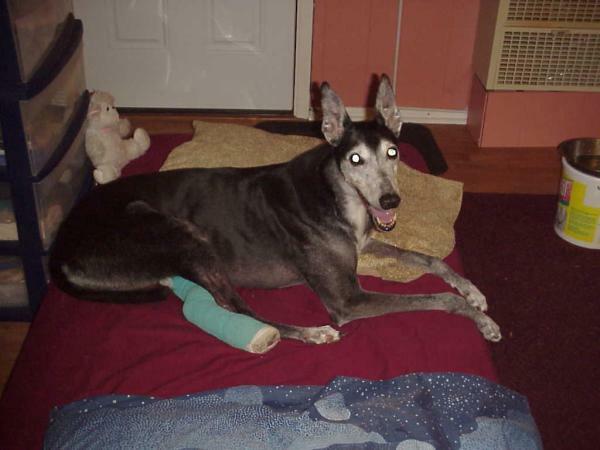 She was having accidents in the house, on dog beds and on our bed! I buy used outdoor patio cushions for my dogs from our local Goodwill stores. They come in all sizes and colors and provide a lot of comfort and usually cost $1 to $2 each. We recently got a new sofa, and found out the old sofa cushions fit perfectly in the XL doggie crate we have for our Lab/St Bernard. So we kept them, and will use them as a nice, sofa-like bed for Barli. I make pet beds for rescues and an easy way to make some is to collect 'shaggy' rugs like bathroom rugs, cut a piece of sturdy fabric the same size and zig-zag stitch it to the back of the rug. I have 6 dogs and 2 require replacing their beds as they have an air conditioned part of my carport and go outside on their own. I simply find old couches that are put out for the trash and if they are clean and don't have wool covers I pick them up and voila! Doggie beds can be made out of used fleece robes found at thrift stores. You can usually pick them up for very little and cut them apart to make a nice bed for your little pet. Take the crib bumpers and fold and layer them to the size bed you want to make or cut a mattress topper to the size of the pet bed you want to make. I had an old memory foam topper that was cut to make quite a few pet beds. Turn a cardboard box (the kind that reams of copy paper come in) into a bed for a small pet by cutting an entrance and lining it with a blanket. How do you make a dog bed? I would add some cedar chips to the stuffing. It is a natural way to repel fleas, and it smells good. My mom uses a pillow with a blanket on top for her dogs to snuggle in. I don't think dogs want anything fancy, only comfy! Go to thrift store buy child's sleeping bag sew up end that you would slip into . stuff with old pillows also from thrift store and zip up . When it's time to wash it just zip it off hang to dry out side on line. I have purchased 2 so I always have one between washes. My dog is a very big boy and it fits him perfectly. His bed is along side of mine and keeps him from trying to jump on mine. Go to a thrift store and buy a fom rubber mattress pad. Cut out a size a little larger than your dog when he is reclined. If he is the right size, a good pillow cover or sham will do for a cover. Velcro the end closed. You can wash the cover, and the foam rubber won't flatten out. This is what I use for my dogs, and it makes a good orthopaedic bed for them. 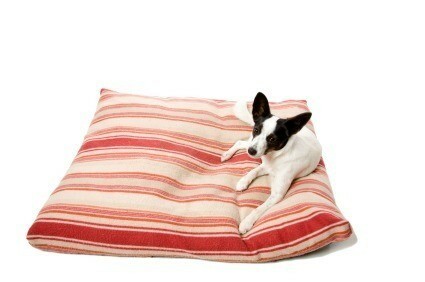 Does anyone have a pattern for a simple and fast doggie bed? I make dog beds out of comforters that I buy and then cut in to 4 pieces. I can buy a queen size comforter at a thrift or discount store for $15. All 4 beds fit in the washing machine so I wash them once a week. I took two old pillows, loosely stitched them together, and as above an old comforter folded over the pillows, I used velco on the bottom to keep the comforter on as our little lady likes to find "just the right spot". Easy to come apart to wash the comforter & air dry in the dryer/hang on the line pillows. I found that the one of our dogs who chooses not to sleep on the bed likes an old towel on the floor next to the bed. I alternate two, one in the wash and the other for Buttons to sleep on. Not a bed, but she really likes it. 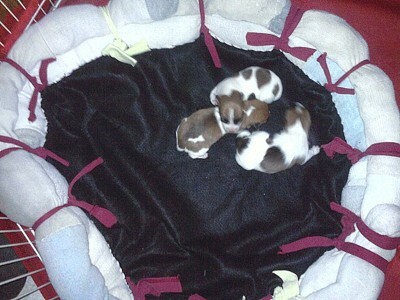 We use baby blankets for our 5 chi's. They're easy to keep washed up. It would be really easy to take 2 quilted baby blankets (baby comforters), sew them together, and stuff, like a big pillow. Depending on the size of your dog. We like finding baby blankets at yardsales. Cheap, cute, comfortable bed. I also use the comforters cut into pieces, folded and stitched. Very easy to maintain. But the fastest and easiest dog bed is an old pillow case that you stuff with a blanket or an old pillow. Sew in the stuffing, or put velcro on the ends to remove the pillow when needed. Just stuff and stitch. I used old jeans to make Biggie's bed. I cut the legs off the jeans & sewed them together after squaring everything. I used a hvy duty zipper I had & took 2 old seat cushions from a sofa that I was getting rid of. It took me all of 2 hours maybe. That has been the best dog bed I have. He loves it & is beside himself when I wash it. For Biggie being a big dog it has worked out great. Could I have a few suggestions on how to make homemade dog beds that are durable for a large breed of dog? Any suggestion on making a cooling bed for a 60lb dog? How would I make a dog bed from an old kitchen chair cushion and old sheets? Do you think it would be comfy if I used a new pool noodle as the sides? P.S. Please tell me your opinions. Make your dog this cozy dog bed with a built in pocket for extra snuggly warmth. This is a guide about making a DIY pocket dog bed. Recycled polypropylene bags can be stuffed with recycled newspaper or other materials and made into an inexpensive dog bed. This is a guide about using a polypropylene bag as a dog mattress. 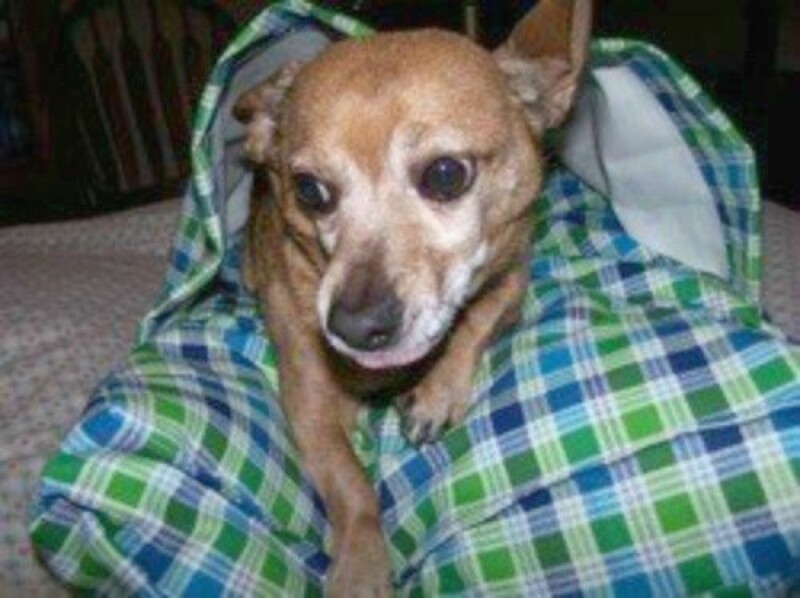 Dog beds can be made from many recycled materials, including old bedding. This is a guide about using a foam mattress pad as a pet bed. 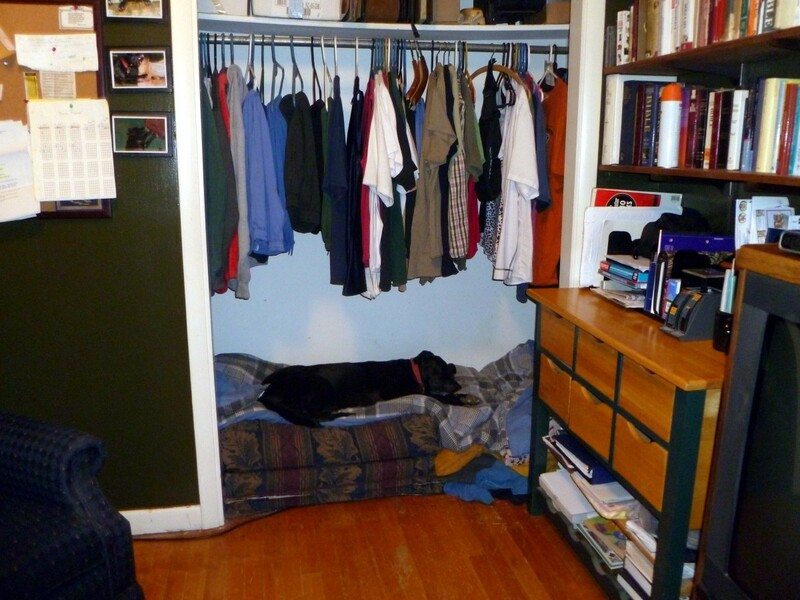 Old worn out socks and clothing can find new purpose when making a bed for you dog or cat. This is a guide about recycled clothing pet bed.